The Joli Times: Birthday on a budget, eat your heart out! Birthday on a budget, eat your heart out! 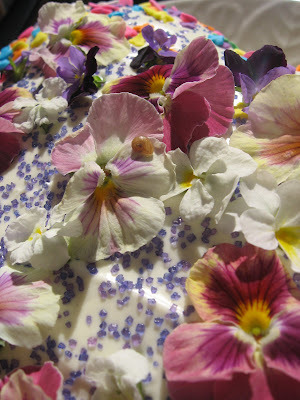 a close up on the organic edible flowers a la escargot! Ok, ok, ok..... so it wasn't exactly a buck for this birthday. But we did pretty dang good. Aleli whipped up a .97 cent cake mix and baked half of it into a heart shaped cake and the other half became cupcakes. 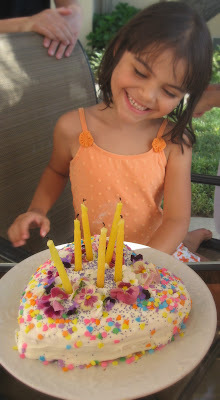 She decorated the baked goodies with only half a tub of $1.27 frosting and used some leftover sprinkles and garden flowers to decorate it. We are still snacking on leftover cake today. 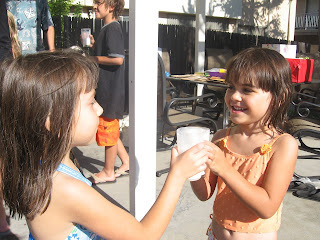 We drank about three quarts of Kool aid (.70 cents worth) from a canister that cost $2.79 for 12 quarts. (Aleli would later learn that the more economical way to buy Kool aid is in the little packets. Who knew. The beverages in her childhood had flavors with fruit names....... "red flavor" isn't something she had much experience with.) There were free grapefruit wedges sprinkled with sugar. 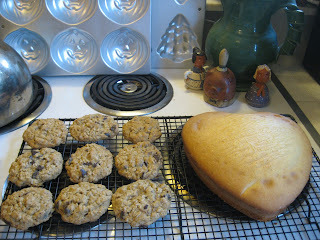 And we finally cracked out some of that frozen cookie dough we made for fresh baked choco oatmeal cookies. Our big splurge came with make your own ice cream ingredients. We used $2.89 of half and half plus about 1/2 cup sugar and some vanilla extract in an activity/ treat for the kids. All in all, let's call it a nice even $8. Good thing we ate a lot of freebies the rest of the day. The kids shake it pool side. * Fill a gallon size Ziploc bag about half full of ice. Add a dash of salt. In a separate sandwich size Ziploc bag, add the half and half, sugar and vanilla. Seal the sandwich Ziploc bag thoroughly and place it inside the large ice filled bag. Seal the large bag and shake it vigorously for about five minutes or until ingredients have thickened to their ice creamiest state. MMmmmm! Enjoy right out of the bag. You can include add ins like crushed peanut butter cups, chocolate syrup or fresh berries once the ice cream is fully churned. Or enjoy it as our kids did, milkshake style, if you want to churn it a little less. Either way, it's delicious and fun! A great cool down on a hot summer day! 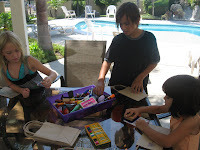 Kids decorate their own loot bags before an afternoon dunk in the pool. Fun on the cheap is WORK! So we sat down at the table after a hectic day of party planning, sun, baking, hosting and what not to see how we were doing money wise. Soooo glad we were sitting because after realizing we were missing a receipt or two and that cards, not cash were used for those purchases....... adjustments had to be made to the money bag. 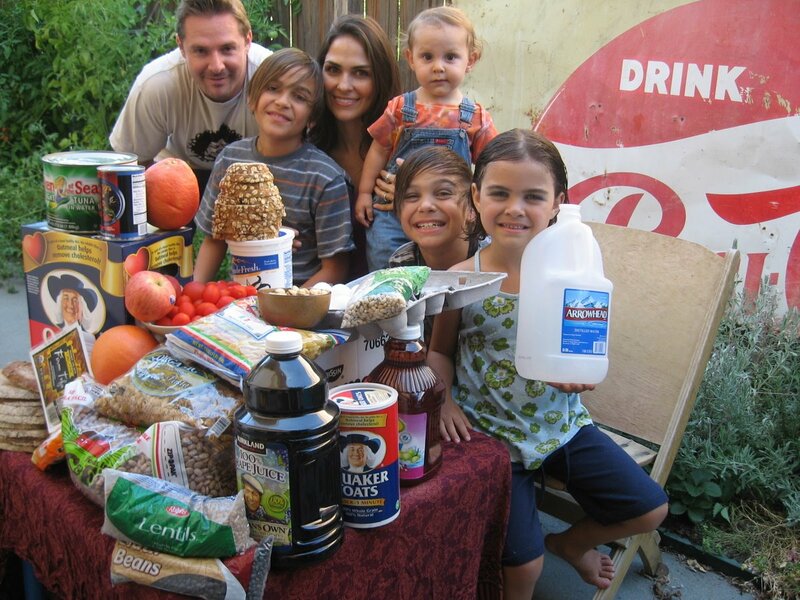 We were at first stunned to discover that in this, the first third of our experiment, we had used up $99.35!!! What?!! How on earth did this happen? We still have like 20 days to go and only $80.65 to go on. That's more like $4 a day. And we have eaten sooo much free food too. Then we realized that expenditure did not equal consumption. Aaaah..... exhale. That's right. We still have 8 pounds of pasta, 9 pounds of pinto beans, 7 pounds of brown rice, 3.5 pounds of tofu, 8 pounds of oatmeal, almost 2 gallons of milk, a fridge drawer full of produce, enough ramen to sicken a small army of kids, etc, etc, etc. We purchased a lot of items up front so that we would have plenty of offerings on hand. oh yeah. We had almost forgotten our own strategy. Money can do that some times. Now it's time to dig deep and just eat what we've got..... not a popular modern habit in any sense, but it's go time now! Wow. Going into this we brought our theories of food culture and what might happen. We thought this would have alot to do with economics and recipes, easy tips, and extra family time spent slow cooking together. The whole topic of food is a lasagna of meaning, custom, significance, ritual. There are many, many layers. As each day has come and gone it has brought its' lessons though. This has really put us in touch with a visceral sense of poverty. But even with what we've experienced, we've had it so easy. The world's poor don't necessarily have a stockpile of food staples, cash and a variety of food and vendor options. They don't necessarily have neighbors dropping in with treats and resources. They don't necessarily have the luxury of creativity at the end of their hard days work....... enough creative thinking to put it all together. There is survival. The only stress we've felt is the stress of change...... not of deep hunger, need or even starvation. 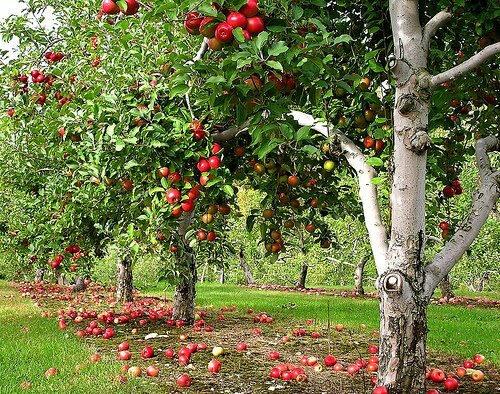 We actually see resources and abundance all around. That's a very different experience. We still can only imagine. We've learned we are gonna need to menu plan. Actually do the sitting down and figuring out in advance part. We've gotta make these next 20 or so days squeeze a bit tighter if we are going to make it. We can't shop so loosely...... have to communicate EVERY purchase. It's kind of annoying actually. We're use to pretty much buying what we feel like, when we feel like it. A soy chai latte here a frappacino there..... you know the drill....... price has been the second consideration. We've gotta use everything we have on hand. Period. No more buying until absolutely needed. We've learned that if you're going to be cooking a lot more, you'd better be prepared to buy a lot more dish soap. We've learned ramen costs the same per serving as regular pasta, dang it! Next time we get a great idea to do something like this.... NO RAMEN. Not necessary. Ramen as cheap.... a myth. Painful learning curves. We learned not to overcook the poor man's crab cake, that a microscopic snail can find its' way onto the violet on a birthday cake, that a vibrant child can virtually blow our budget on the first day out by over "cinnamoning" free toast and that meals are best spent among friends and family. We've learned that the Beatles got it right....... you do get by with a little help from your friends! 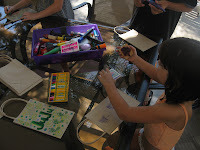 We've learned we live in an amazing community and that peoples minds and imaginations are thriving, active. We've learned that Mama Nature still works. The earth is still fertile, alive and sharing her gifts. The sun still ripens a tomato better than any gas in a factory could ever hope to, and even in wild places there are edibles to be savored (like lamb's quarters and young dandelion greens and nettles smoothies!). We've learned that we have a lot more to learn. Hello darling Aleli. I love this blog! I've named the photo of you cooking the poor man's crab cakes as "Madonna of the Fish Cakes". Love seeing all the picks of the kids. Baby cracks me up. His little body - just in there in all the action. He totally holds his own.